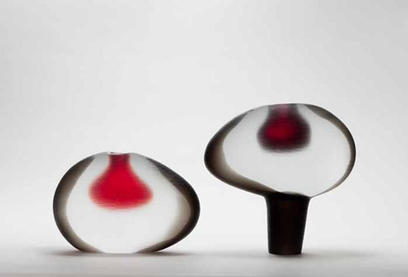 Born in 1912 in one of the most important families of Murano glassmakers, Alfredo Barbini started working in the furnace when he was a little more than a child. When he was not eighteen yet, he became Master, showing an inner ability in the shaped glass and by leaving amazed the ones who saw him at work. The first essential moment for his artistic growth was the meeting with the sculptor Napoleone Martinuzzi who hired Barbini in his glass factory, the Zecchin-Martinuzzi. Here Barbini participated in the creation of first sculptures in massiccio glass, in Novecentista style, drawn by Martinuzzi in person. The collaboration between them continued over the decades. When the Zecchin-Martinuzzi closed, Alfredo Barbini joined the V.A.M.S.A. (Vetreria Artistica Muranese Società Anonima) as master. His contribution was very important, especially in the field of glass sculpture and in the one of thick substance, with particular chromatic effects, as the "Vetro Fumato". In 1946 he became the associate and artistic director of the new factory Gino Cenedese & C.
In 1948 he took part in his first Biennale with another of his creations: the "Acquari", irregular blocks of glass where there are fishes and sea creatures, shaped in advance. In 1950, Alfredo decided to found his own glass factory, helped by his daughter oceania, who was in charge of administration, and his son Flavio, who drew several collections. The factory was a sort of cathedral of gothic inspiration, built in a very big garden and with windows of different tones of colours, which let the same quantity of light come in all day long, from sunrise to sunset. There, he continued to create and innovate: his works were shaped on one unique block, very thick with stratifications of different tones which increased the sculptural texture; he played with dark colours from which he created a whole range of shades. To remember also the pieces drawn for him by Napoleone Martinuzzi, in the mid-sixties. They were simple shapes with a decorated surface. 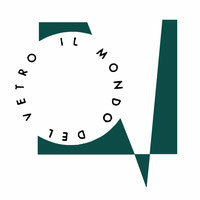 With Alfredo Barbini's death, on the 13 February 2007, the glass factory ceased the production.